#AyushmannKhurrana and #VickyKaushal, the two massively talented and next-gen content driven superstars are looking dapper on the latest cover spread of leading fashion magazine #Grazia. On the cover, Vicky is sporting a green blazer, golden yellow tee and multi-colour pants. Whereas Ayushmann is seen in a vibrant floral shirt and yellow suit! Duo has a chilled out and relaxed vibe on the cover. 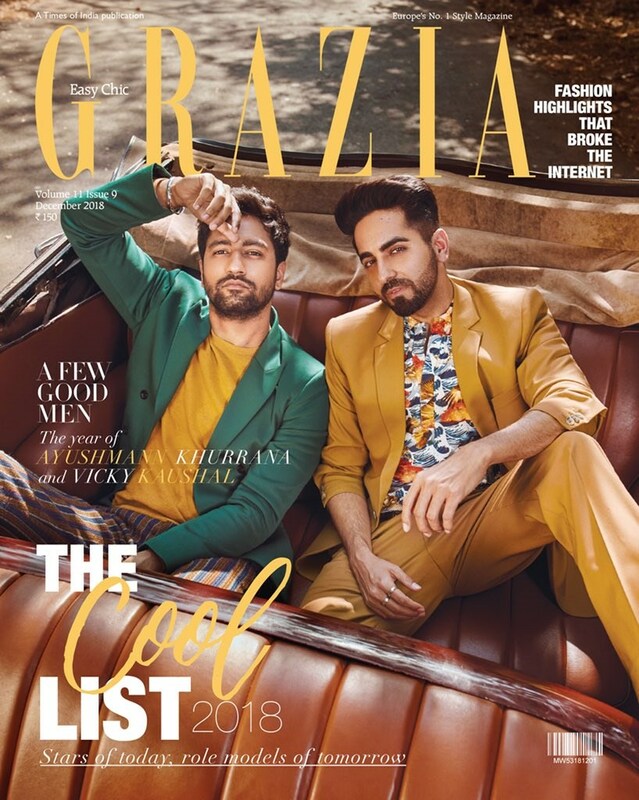 On the work front, Ayushmann has belted out back to back hits, such as AndhaDhun and Badhaai Ho. Next, he will be seen sharing screen space with Nushrat Bharucha in forthcoming Dream Girl under the banner of Balaji Motion Pictures. As for Vicky, the actor is all set to break his typical lover boy image in forthcoming “URI – The Surgical Strike” an upcoming war action film written and directed by debutant Aditya Dhar and produced by Ronnie Screwvala under his banner RSVP Movies. The film is based on the 2016 Indian Army's surgical strikes on Pakistan as retaliation for the Uri attack. The film also stars Paresh Rawal and Yami Gautam, it is set for a theatrical release on 11 January, 2019.